Need a Haircut? Check Out the Robot Barber! Robots are the future. People have been saying that before I was born. Books have been written. Movies have been made. We are in their future, and we now have robots. Lots of them. Sure, the state of technology is still not at par with many a writer’s imagination, but we have come a long way. There is even such a thing as a robot barber! Intelligent Automation, a company specializing in robotics (among other things), has created what is called the Multi-Arm Unmanned Ground Vehicle or MA-UGV. This robot has three arms, three cameras, and 29 degrees of freedom. And boy, can it do a lot of things! The Multi-Arm Unmanned Ground Vehicle gives the operator the ability to control it at precise degrees. Some of its functions which have been demonstrated are dual-arm backpack inspection, tool handling, shovel manipulation, door breaching, knot tying and IED defeat. Obviously, the robot was designed for military purposes. 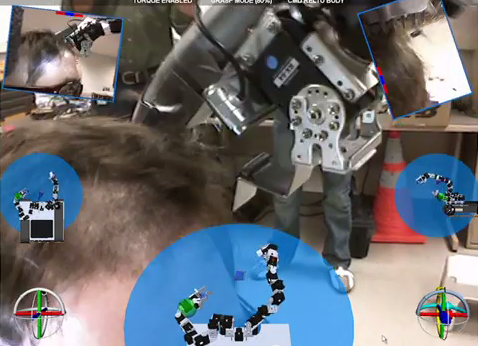 However, to demonstrate the capabilities of this robot, the guys thought they would have a little bit of fun and turn it into a robot barber. I pity the guy who had to “volunteer” his services as the haircutee (yeah, I invented a word again). Then again, if all you need is a shaved head, it does not really matter, does it? Here is the robot barber in action. If you want to know more about the robot barber – technical aspects and what it can actually do – visit Intelligent Automation.